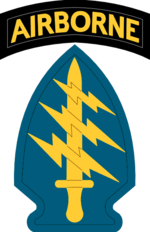 The 3rd Special Forces Group (Airborne) – abbreviated 3rd SFG(A) and often simply called 3rd Group – is an active duty United States Army Special Forces (SF) group which was active in the Vietnam Era (1963–69), inactivated, and then reactivated in 1990. The 3rd SFG(A) was primarily responsible for operations within the AFRICOM area of responsibility, as part of the Special Operations Command, Africa (SOCAFRICA). Its primary area of operations (AO) is now Africa as part of a 2015 SOCOM directive but 3rd Group has also been involved in the Caribbean and the Greater Middle East. The 3rd SFG(A) has seen extensive action in the War on Terror and its members have distinguished themselves on the battlefield in Afghanistan. The 3rd Special Forces Group was reactivated in 1990. Its AO initially consisted of the Caribbean and West Africa. New group members were drawn primarily from the 5th SFG(A). At the outbreak of the Gulf War, 3rd Group's only functioning battalion (1st BN) was deployed to Dhahran, Saudi Arabia, for three months. Its A-Teams carried out reconnaissance and sabotage missions into denied areas of Iraq and Kuwait. In February 1991, 3rd Group was tasked with the mission of securing and occupying the U.S. Embassy in Kuwait City. 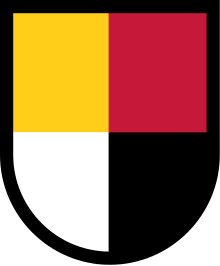 The 2nd BN and 3rd BN of 3rd Group were reactivated in 1991 and 1992, respectively. 3rd Group also took part in the restoration of democracy in Haiti in 1994. In the late '90s, 3rd Group helped train forces in Senegal, Uganda, Malawi, Mali, Ethiopia, and Trinidad and Tobago, among others. In the fall of 2000, the 3rd SFG(A) was involved in training and stabilization efforts in West Africa, dubbed "Operation Focus Relief" by the State Department; the training mission was geared towards combating the Revolutionary United Front. As we have listened to these incredible tales, I am truly at a loss for words to do justice to what we have heard here, where do we get such men? … There is no finer fighting man on the face of the earth than the American soldier. And there is no finer American soldier than our Green Berets. If you saw what you heard today in a movie, you would shake your head and say, "That didn’t happen." But it does, every day. Members of the 3rd SFG were involved in the 2003 invasion of Iraq, 26 Green berets from the group were given the task of securing a key crossroads near Debecka in Northern Iraq between the cities of Irbil and Kirkuk. If they succeeded, they would cut highway 2, preventing the Iraqi army moving north into Kurdistan and allow friendly forces to take the crucial Kirkuk oilfields. The 26 Green Berets were divided into two A-teams; ODA 391 and ODA 392, they were equipped with GMVs (Ground Mobility Vehicles)-modified Humvees with 50 caliber HMGs and Mark 19 Grenade launchers that could travel a thousand miles without resupply. the ODAs conducted battle training in Fort Bragg, North Carolina and Fort Pickett, Virginia between October and December 2002, On March 8, 2003, the ODAs flew from Pope Air Force Base to Romania and on 26 March 2003 they infiltrated northern Iraq via a MC-130 Combat Talon landing at Al-Sulaymaniya, some 60 miles east of Kirkuk. In their first few days in Iraq they participated in Operation Viking Hammer and then on April 1, 2003, they moved to Irbil and onto a staging area where they linked up with ODA 044, 10th SFG and their Peshmerga allies. On April 4, 2003, they were given a new mission, code-named Northern Safari, they were to seize the Debecka intersection until relieved by the 173rd Airborne Brigade's artillery component, On April 5, they moved into position to seize the intersection and then on April 6 they ran into Iraqi army forces and the Battle of Debecka Pass ensued, resulting in American and Peshmerga victory. The Special Forces secured the crossroads and endured two days of Iraqi artillery fire and then into Kirkuk to secure the oil facilities to prevent their destruction by Iraqi forces. In October 2010, Staff Sergeant Robert James Miller was posthumously awarded the Medal of Honor. On January 25, 2008, Miller's team was ambushed during a combat reconnaissance patrol in Kunar Province near the Pakistan border. Miller's commander was seriously wounded within the first minutes of the attack. Wounded and under intense enemy fire, Miller held his ground and laid down suppressive fire on multiple insurgent positions, which allowed his wounded commander to be pulled out of the line of fire and his teammates to safely reach cover. Miller single-handedly eliminated several insurgents before succumbing to his wounds. Medals awarded to soldiers of the 3rd SFG(A). During August and September 2006, the 1st Battalion, 3rd Special Forces Group (Airborne), United States Army, displayed extraordinary heroism and outstanding combat ability while battling insurgents in support of a Canadian-led operation in Afghanistan. After completing their initial objectives, they willingly engaged a much larger force to secure the Canadian Battle Group’s flank and prevent the enemy from staging an effective counter-offensive. Outnumbered and facing a well-prepared enemy, they were relentless in their assault and eventually captured the position after days of intense fighting. On October 4, 2017, 12 soldiers from the 3rd SFG and 30 Nigerien soldiers were ambushed in the Nigerien village of Tongo Tongo by the Islamic State in the Greater Sahara, which killed four Americans and four Nigeriens. ^ Naylor, Sean D. (27 August 2009). "SOCom directive announces major changes". Army Times. Retrieved 24 October 2014. ^ Sutherland, Ian D.W. (1990), Special Forces of the United States Army: 1952–1982, San Jose, California: R. James Bender Publishing, pp 297–300. ^ Smith, R. Jeffrey (4 March 1991), "U.S. Special Forces Carried Out Sabotage, Rescues Deep in Iraq", The Washington Post. ^ Diaz, Tom (20 March 1991), "Special Forces Busy in Kuwait", The Washington Times, pg 1. ^ Goff, Stan (2000), Hideous Dream: A Soldier's Memoir of the US Invasion of Haiti; Soft Skull Press. ^ a b "3rd Special Forces Group (Airborne), 1st Special Forces Regiment". Global Security. Retrieved 24 October 2014. ^ Patrick Jennings (20 May 2010). "Danger Close: ODA 3336 in the Shok Valley". Defense Media Network. Retrieved 5 March 2013. ^ "U.S. Army unit receives Commander-in-Chief Unit Commendation for Operation MEDUSA". National Defence and the Canadian Armed Forces. 29 May 2012. Retrieved 24 October 2014. ^ Hartmann, Margaret (19 October 2017). "What We Know About the Niger Attack That Left 4 U.S. Soldiers Dead". New York. Retrieved 19 October 2017. ^ Transcript of Jeffrey McDonald’s Article 32 Investigation Hearing, 1970, Vol. 12., CPT Richard Thoesen, MSC: "I came to know Captain McDonald when he reported to the 3rd Special Forces Group. I was his sponsor… In the latter part of August… 1969…"